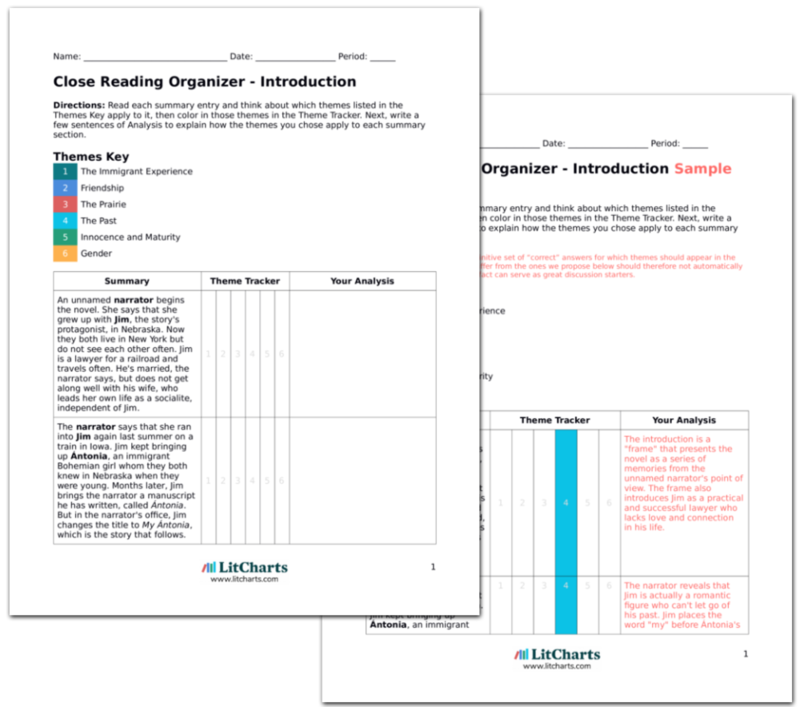 LitCharts assigns a color and icon to each theme in My Antonia, which you can use to track the themes throughout the work. That winter, Jim spends many evenings at the Harlings, playing games and listening to Ántonia's stories. One night, Ántonia tells a story about a tramp who wandered into the farm she was working at the year before and jumped into the threshing machine, killing himself. Ántonia wonders why he would kill himself in summer, when everything is good. Ántonia is not disturbed by the tramp's suicide but by the season in which it occurs. Although she is happy in town, the prairie will always be home to her, and she cannot comprehend that someone could feel otherwise. Sprow, Victoria. "My Antonia Book 2, Chapter 6." LitCharts. LitCharts LLC, 22 Jul 2013. Web. 1 Dec 2018. Sprow, Victoria. "My Antonia Book 2, Chapter 6." LitCharts LLC, July 22, 2013. Retrieved December 1, 2018. https://www.litcharts.com/lit/my-antonia/book-2-chapter-6.